Install from the official repository. Comment out the lines below. This is needed to prevent a bug that causes Gnome Terminal to fail to open after screenfetch has been executed and the terminal closed. Rebooting the system is the only apparent fix when this happens. Open the user login shell initialisation file. Commands in this file will be executed at login for the current user only. Open the system wide login shell initialisation file. Commands in this file will be executed at login for all users. Open the user interactive shell initialisation file. Commands in this file will be executed every time a shell is opened for the current user only. Open the system wide interactive shell initialisation file. Commands in this file will be executed every time a shell is opened for all users. Append the command to the end of the chosen file. 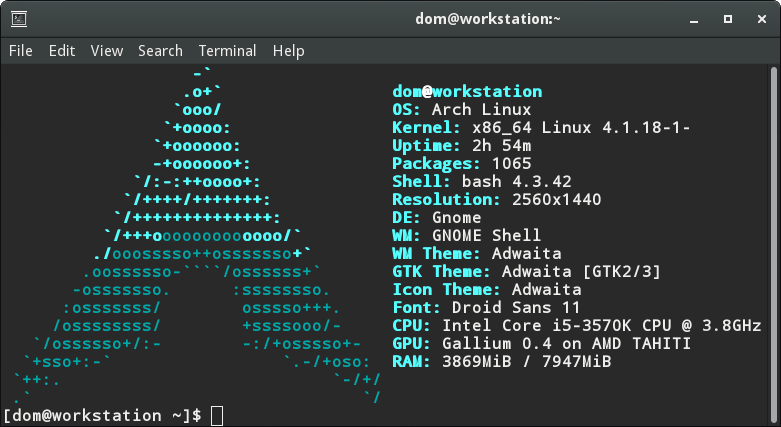 Depending on the configuration each time a specific user or any user logs in or opens a terminal window, screenFetch output will be printed automatically displaying system information and a nice distribution specific ASCII drawing.